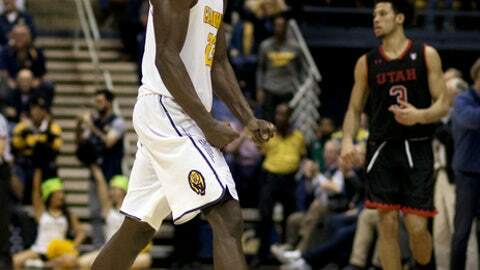 BERKELEY, Calif. (AP) Jabari Bird saw point guard Charlie Moore drive into the lane and knew the ball might come his way. Bird scored 10 points of his career-high 26 points in the second extra period to help the Bears (16-6, 7-3) move into a third-place tie with UCLA in the Pac-12 standings. ”Charlie did a great job of not forcing the shot,” Cal coach Cuonzo Martin said. Moore had 17 points, seven assists and three steals for Cal, which has won six of its past seven games. Ivan Rabb logged his 11th double-double of the season with 12 points and 14 rebounds. Bird, a senior guard, scored just five points in the first half. But he had 16 in the final four minutes of regulation and the two overtimes. Kyle Kuzma had 23 points and 14 rebounds for his 13th double-double to lead Utah (15-7, 6-4) and Lorenzo Bonam scored 15 points, nine of them coming in the second overtime. The Utes had 19 turnovers, 10 of them in the first half. In the first overtime, Kuzma scored a layup with seven seconds left to tie the score at 62-all. Bird had given the Bears a lead by hitting a jump shot with 22 seconds remaining. Moore had a chance to win it in regulation, but missed the second of two free throws with three seconds left, leaving the score tied at 55-all. Cal built leads of 8-0, 12-2 and 18-4. Utah crept within 34-26 by halftime, but did not take its first lead until David Collette hit two free throws for a 51-50 advantage with 6:05 left in the second half. Utah: The Utes, with a chance to move into a tie for third place, dropped to a share of fifth place in the Pac-12 with USC. With an RPI computer ranking of 75, the loss further clouds their NCAA Tournament picture. Cal improved to 3-0 this season in overtime games. They beat UC Irvine 75-65 and Louisiana Tech 68-59, both in single-OT games. Utah entered the game shooting a conference-best 53.9 percent in Pac-12 games, but converted just 41.5 percent against the Bears. It didn’t help that Cal blocked nine of the Utes’ shots. Utah: The Utes on Saturday visit Stanford, where last year they lost 70-68 in overtime. Cal: The Bears complete a three-game home stand Sunday against Colorado. The Bears are 11-1 all-time against the Buffaloes in games played at Berkeley.